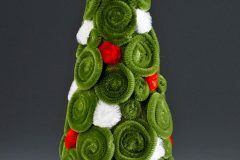 I love those dollar store fake foam pumpkins, but what can you do with them? Facebook fan Christina S. has a question I think we’d all like to know the answer to: “I have a dollar tree foam pumpkin…what should i do with it–any ideas? ?” Well, Christina, I have four foam pumpkins, and I need to figure out what to do with them too! So many options! Well, I pretty much HAVE to mention the duct tape pumpkin I just made, right? 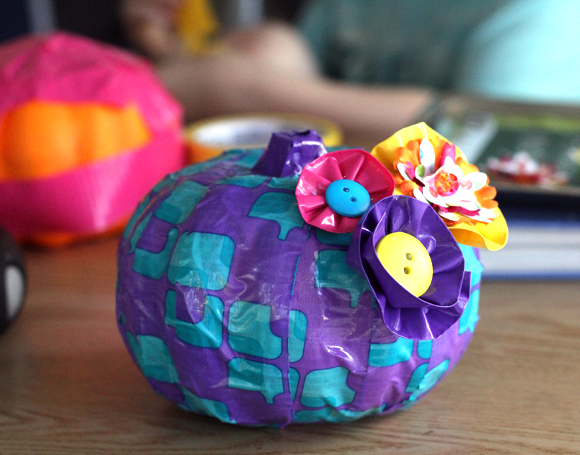 Cover a pumpkin with duct tape, make a few flowers, and you’re done. Old work shirt, meet pumpkin. Easy way to cover a dollar store foam pumpkin and result in a cute country pumpkin! While looking at the country pumpkin above, I found this awesome tutorial also by Viv, on how to paint a fake foam pumpkin to make it look more realistic. This is great! 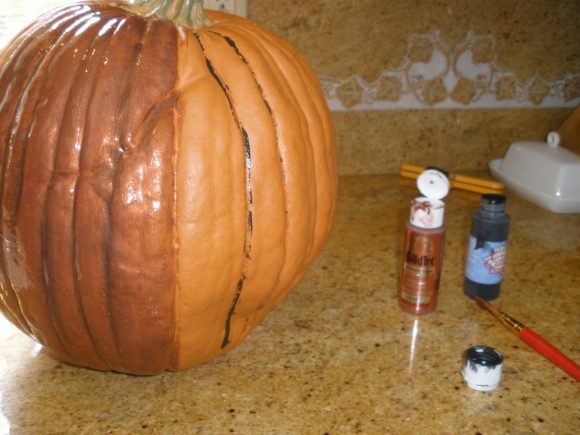 Everyone wants a realistic fake pumpkin. These are so pretty! My good friend Alexa over at The Swell Life is the queen of Halloween crafting, and she’s been posting great pumpkin craft ideas all week. 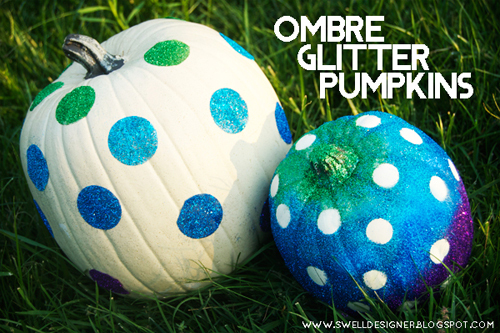 These ombre glitter pumpkins are so cute, and easy, too. Okay, I’m gonna try really hard not to repost Alexa’s entire blog right now, but she has done some SUPER CUTE pumpkins. 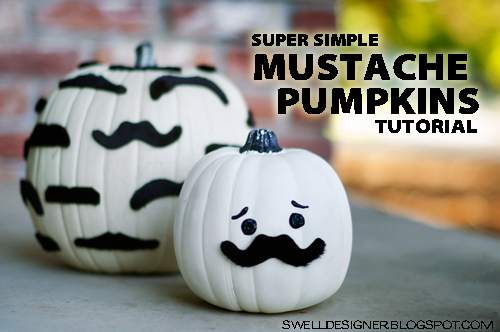 Like these mustache pumpkins using fake mustaches from the dollar store. Eeee. Everything is better with fake mustaches from the dollar store! 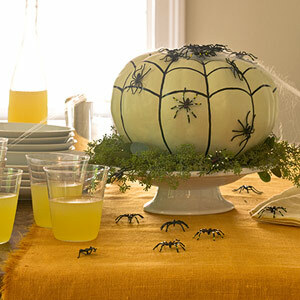 Great deal for a simple and elegant centerpiece with a tiny splash of creepy. 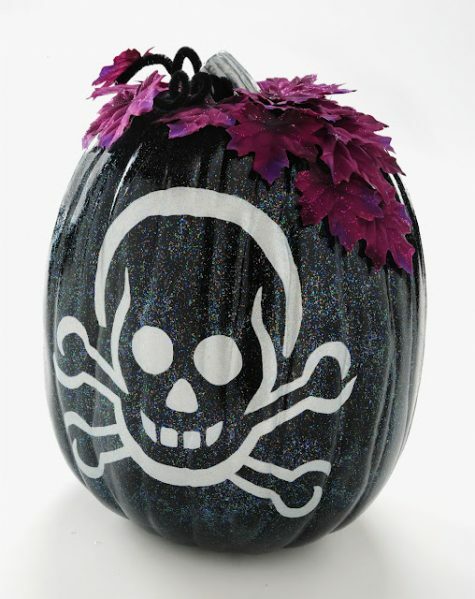 If humorous gothic is more your speed, how about this sparkle skull pumpkin from Amy at Mod Podge Rocks. The burgundy foliage adds just the right touch of macabre gloom. I love this idea! Cross stitch on a pumpkin. Don’t say I never did anything for you! 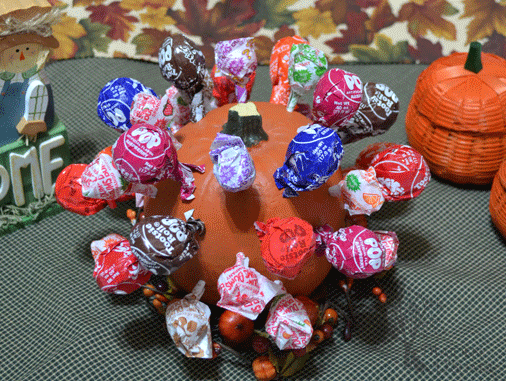 Here’s a cute idea for handing out suckers on Halloween: make a fake pumpkin lollipop holder. This is also a great carnival game (color a black dot on the bottom of the winning suckers – the person who pulls it wins an extra prize). 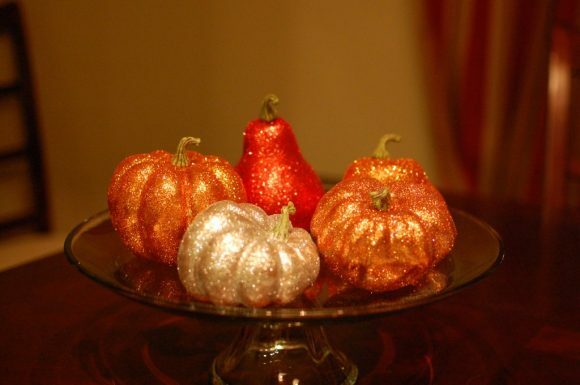 This gorgeous photo and these gorgeous sparkly pumpkins and gourds are by a blogger who claims she isn’t crafty at all. But LOOK HOW PRETTY!! If you are a beginning crafter, look what awesome pumpkins you can make with just some glitter and glue. Come to the crafty side… we have glitter! 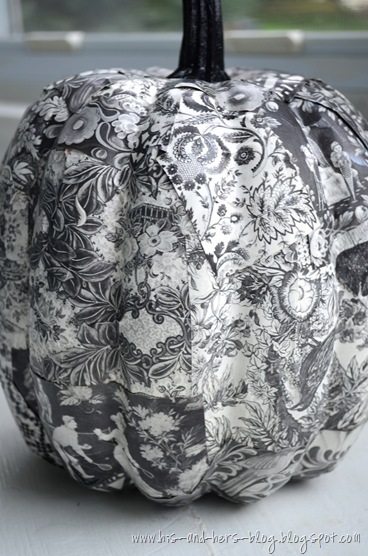 This pretty black and white pumpkin has a gothic romance vibe that comes from using pages of an art textbook. Simple project that just uses Mod Podge and paper. The best part? You can get any look you want by decoupaging paper to a pumpkin! If you feel like getting a little more detailed with your fake pumpkin crafts, this terra cotta mosaic pumpkin is pretty cool! 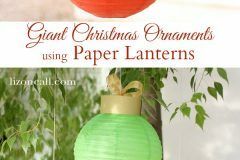 It will probably take several hours to complete, but the final look is pretty cool, and you can set it out on your patio year after year. Some dollar store pins and a pack of sequins – that’s all you need to decorate a fake pumpkin up in disco style. This sequined pumpkin seems like a relaxing craft to do while watching your favorite TV show. Simply place some cutouts on a pumpkin with a dab of glue or some straight pins to create this swarm of bats pumpkin by Kami at No Biggie. Alexa from The Swell Life created this cool distressed subway art pumpkin. 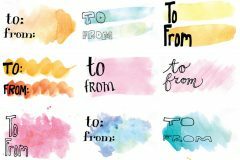 It’s as simple as letter stickers and spray paint. Have I missed any cool pumpkin decorating ideas? Give us a comment and a link! Your mustache pumpkin link leads to the ombre pumpkins, which are pictured above the mustache pumpkins. Just thought you’d like to know! Great ideas, by the way. @Hannah, thanks! All fixed now. These are some really cute ideas for pumpkins. Thank you for sharing. Google image search “brass tack pumpkin” it’s a great way to spruce up foam pumpkins, too! Does anyone have link where “dollar store PUmpkins $1” can be purchased? 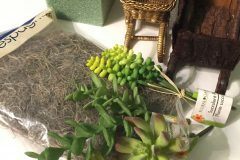 I went to three dollar stores today plus have been searching on line and nothing!! I found carve-able foam pumpkins for $19.99 for a set of three…. too much! I need about 20 for a project I am doing. Any guidance would be MOST appreciated. Thank you so much Heather! I just ordered a case. They are going to be perfect! i am going to make the black jeweled pumpkins shown here for the window of my resale shop. PS I had searched google on ‘foam pumpkins’ and ‘carveable pumpkins’ and all sorts of terms that should have found these and they never came up. Thanks again! 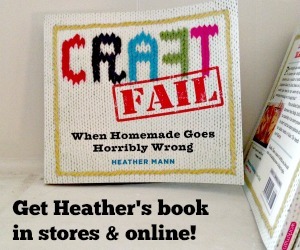 Thank you so much for including me in this fun roundup, Heather! I used dollar store pumpkins to make a topiary. Those pumpkins are great- thanks for the other great ideas! Cute cats made from pumpkins! Check back to see progress on this mosaic project. LOVE the cross stitch and mustache pumpkin ideas! I went to the link to purchase the pumpkins, but those are 6″ pumpkins. The crafts all show much larger pumpkins. Does anyone know where the pumpkins pictured in these crafts could be purchased for a reasonable price? @Kathie, you can buy larger pumpkins at Michaels and JoAnns. 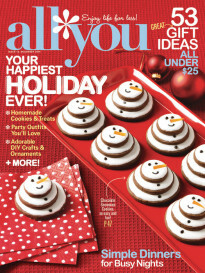 They have intermittent sales during the fall season, or use a coupon. Is there any way to order the foam pumpkuns rt now? @sherry, no, the foam pumpkins are a seasonal item at the dollar store. Look for them starting in August-ish. Very cute ideas for halloween.